Mitch and Melissa met in third grade, but, according to Melissa, boys have cooties at that age, so the pair didn’t hang out until junior high. They spent time with similar people, and in high school they became friends. Much later, in 2012, she was recovering from an oral procedure, which meant stitches and a liquid diet. Because she couldn’t eat, she lost 20lbs, something her doctors had warned her about. During the healing process, Mitch was one of the few people who could brighten her day. 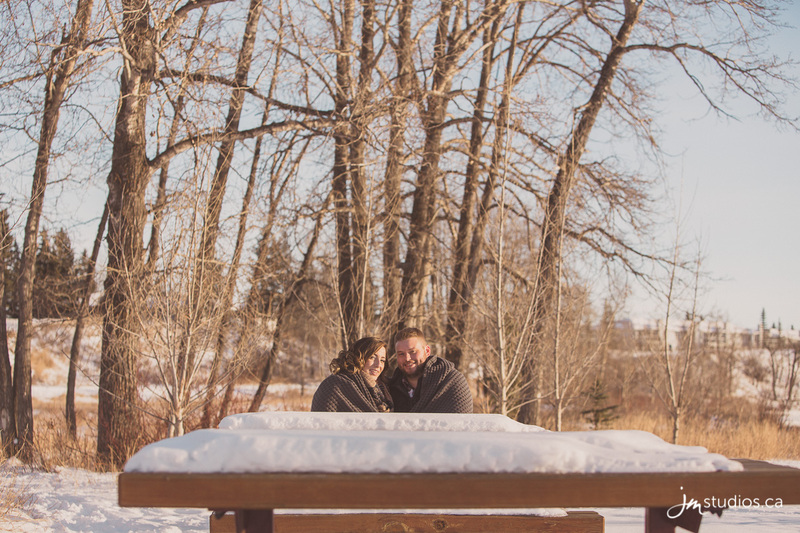 He sent her a funny Christmas card, and during a fit of laughter, she realized something. She needed Mitch as her life partner. They began to flirt more and move beyond the realm of friendship, and he promised that when she could eat solid food again, he would take her out for a steak dinner. So, in February, they did just that. After their first date, Mitch was called up North for work, to continue his gruelling schedule of several months on, mere days off. This meant that the beginning of their relationship was developed mostly over the phone and by text message. When his schedule adjusted to two weeks on, two weeks off in September, they made their status as a couple official. 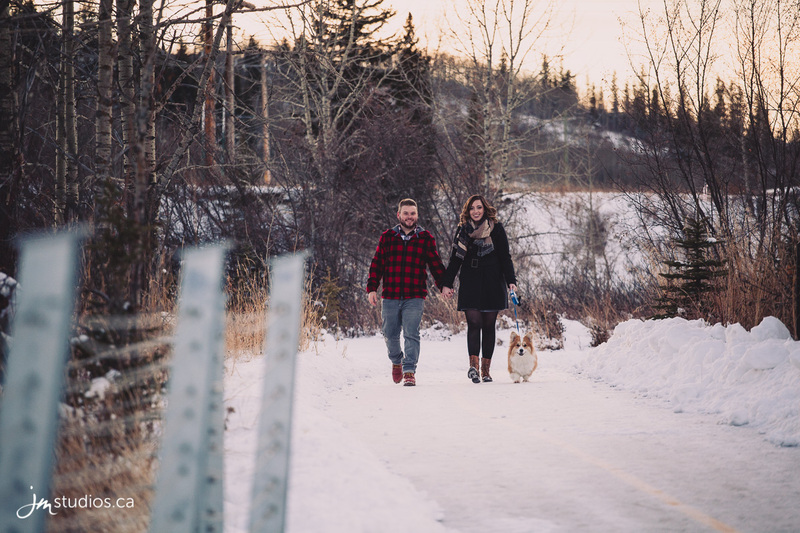 Over the course of their relationship, Melissa and Mitch developed a tradition of going to the mountains for their September anniversary. Last year, they had to postpone the trip until October, a week before they were going to Mexico. 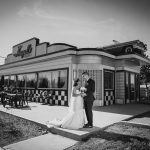 Melissa had a hunch they would get engaged down South, but Mitch had a surprise up his sleeve. 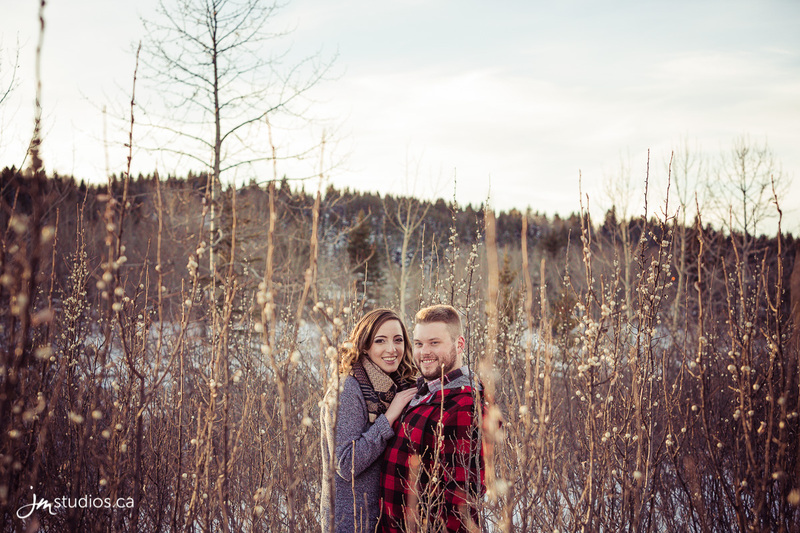 The couple booked their weekend in the Rockies, and Melissa insisted they go to Lake Louise, a place of unmatched beauty that Mitch had never seen! They spent their time in Banff, and Mitch finally saw Lake Louise. When they got there, they wandered near the Chateau, and he found a beautiful quiet spot along a stone retaining wall, far from the other visitors. He dropped to one knee, much to Melissa’s surprise, and proposed. Melissa always knew she wanted a Tacori ring. The California jeweller creates artisanal engagement rings with a signature crescent silhouette in the band. They are beautifully handcrafted heirlooms, and Melissa knew they came with a price tag to reflect their intricate design. Mitch chose Melissa’s Tacori ring himself, reflecting a fusion of both his and Melissa’s tastes. He chose a brilliant princess cut, with beautiful square diamonds along the side. Melissa is thrilled with it. 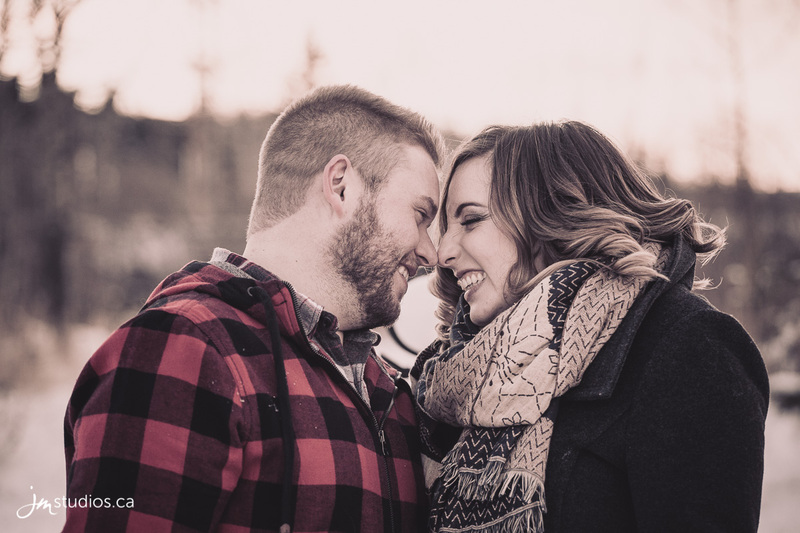 For their engagement session, we met Mitch and Melissa at their home, where Michelle Walsh of Michelle Suffolk-Walsh Hair and Makeup was putting the final touches on Melissa. 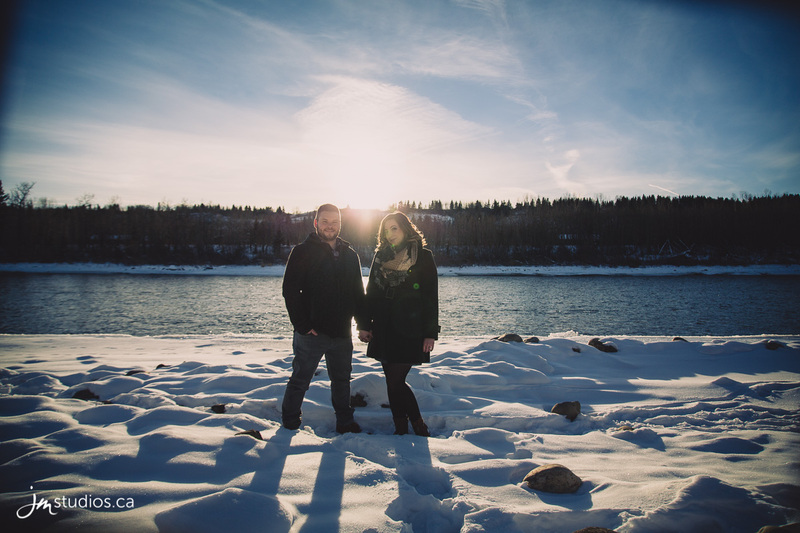 We headed out together and ended up at Riverfront Park in Cochrane, one of Mitch and Melissa’s favourite local spots. 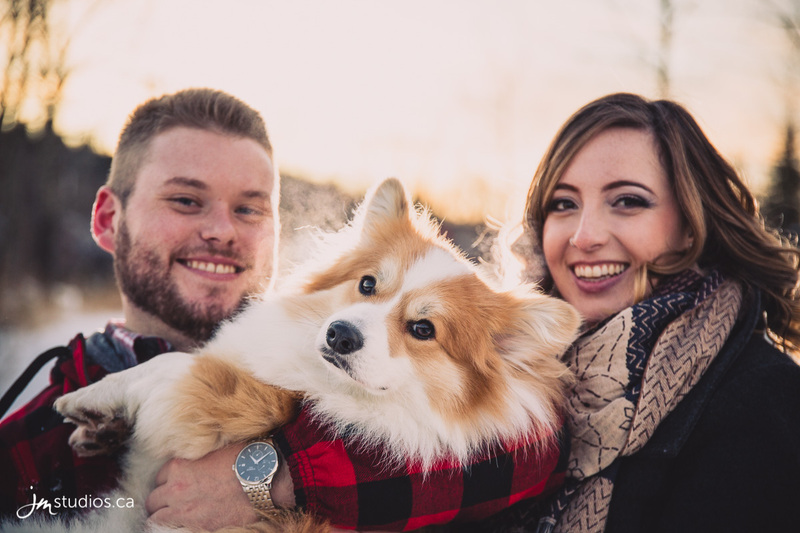 Their adorable fluffy corgi puppy Bilbo (who we would later incorporate into the shoot), loves to run around the off-leash dog park. 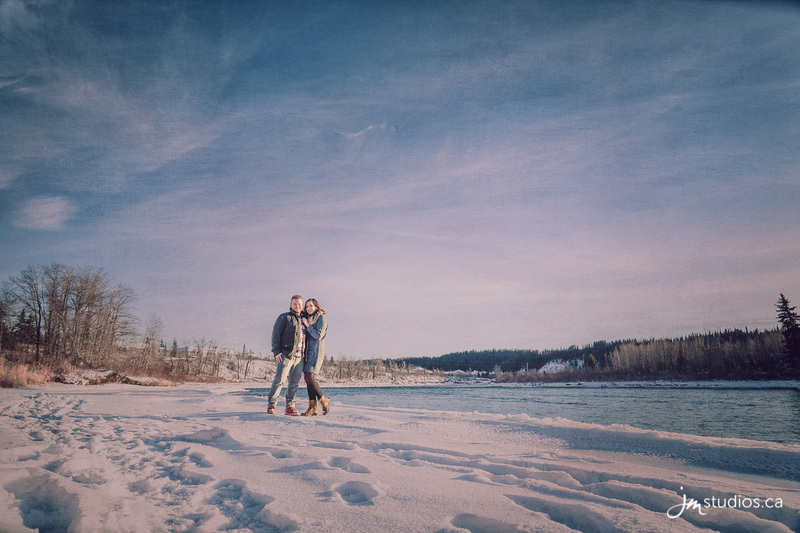 Alberta had been freezing in the week leading up to the shoot, but to our surprise, we were treated to some unusually nice weather. 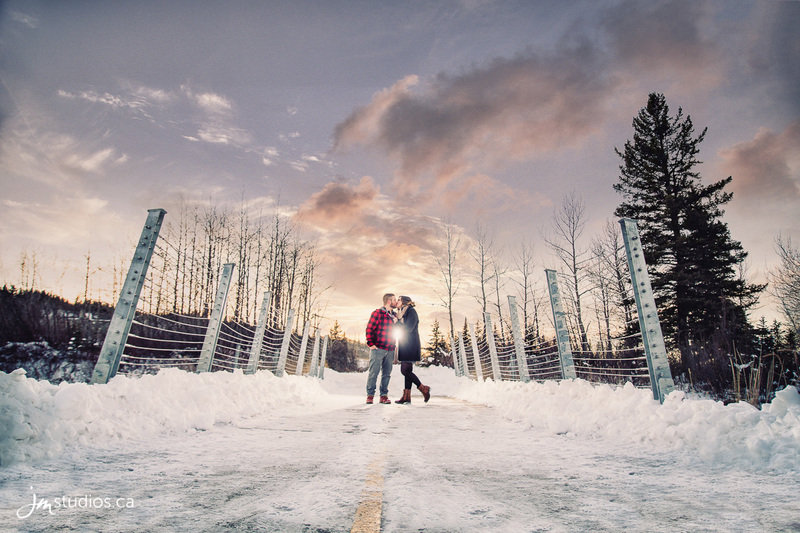 Compared to the -30 degrees Celsius the region had been experiencing, the sun was warm and pleasant. 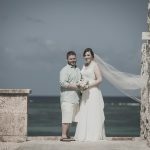 Mitch and Melissa were even able to take their jackets off for a few shots! We started down by the water, in a section near the end of the park with picnic tables and deciduous trees. The low hanging sun cast a warm golden glow through the trees; it was a perfect way to begin the session. The Bow River runs along Riverfront Park, which itself lies in a valley. Due to its location, the sun disappears much quicker than it would out on the prairies, so as we were finishing up in the trees, the setting sun illuminated the water. Because of the recent freeze, there was a thick layer of ice surrounding the river, so we were able to move right to the edge. The light was incredible. It lit up behind the silhouetted couple in a radiant glow. We pulled back to incorporate the sky, streaked with wispy white clouds. Nearby, we found a collection of bushes, still covered with little white berries. In the shots, the berries looked like floating orbs, lighting up like a bokeh effect. Before evening descended, Mitch and Melissa ran home to get Bilbo. 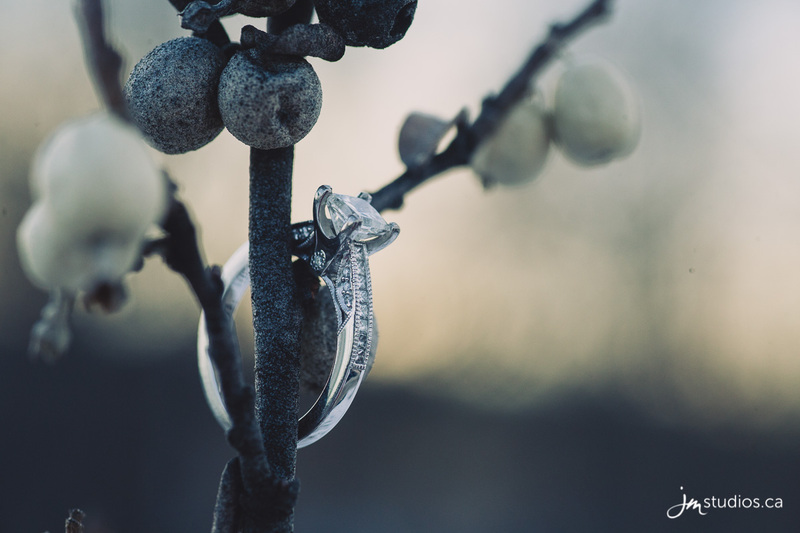 In the meantime, we photographed Melissa’s Tacori ring, hanging it amongst the berries and on twigs in the trees. Bilbo arrived, excited to be at his favourite park. We walked along a path in the woods, Bilbo prancing through the snow. 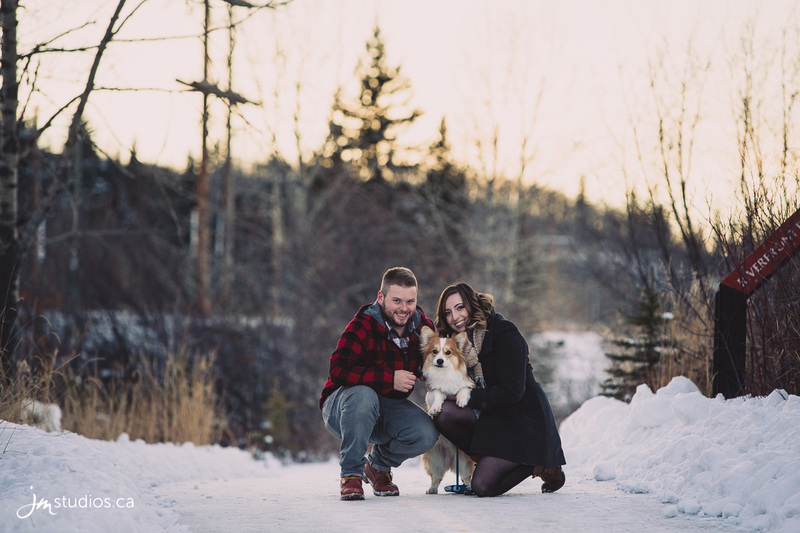 We got some family shots of the couple and their puppy and wrapped up the session in the park over a long bridge. The sky was in full sunset mode, with vivid blues and oranges painting the sky. On the bridge, several metal poles stretched skyward, making an excellent contrast to the nature all around them. We lit the shots with flash, and after a few close-ups, it was time to head home. To end the day, we stopped off at Mitch and Melissa’s. 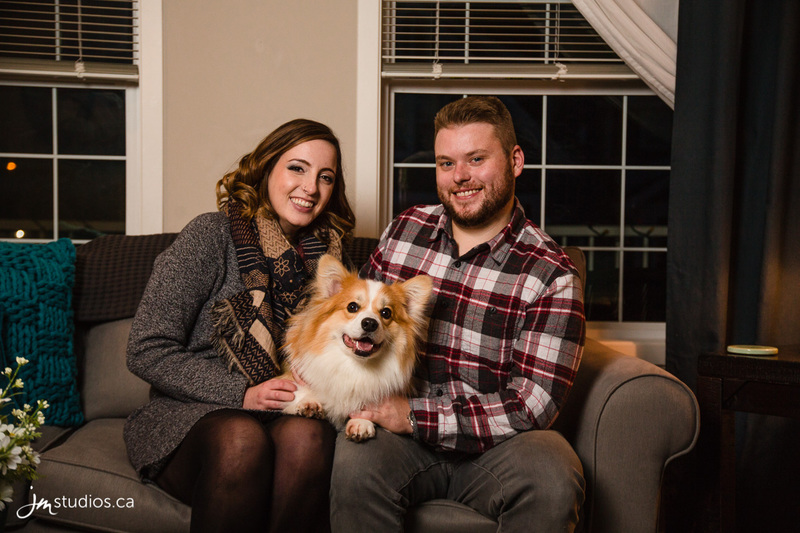 They sat on the couch, and we photographed them in the house where they will soon begin their married life.